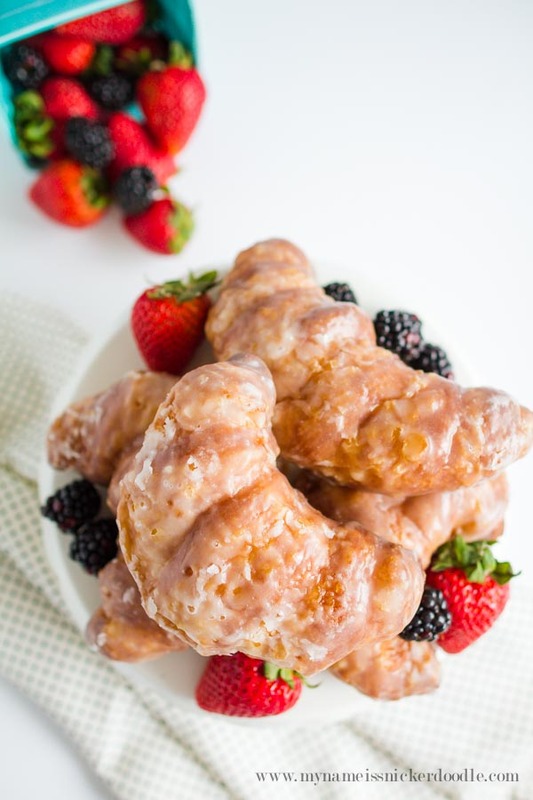 Welcome back to Amy from My Name is Snickerdoodle, sharing this yummy sweet berry croissants recipes, just in time for Mother’s Day! This spring my family and I went to a local farm to pick fresh strawberries! It’s become a tradition and we all love it. We happened to go on a day they were $.99 lb. I put all of my boys to work and had them pick twice as much because I started thinking of everything I could make with them! They didn’t mind one bit. Last year shared how to flash freeze strawberries, so if you happen to have a ton, it’s super helpful to have them last for months in your freezer! 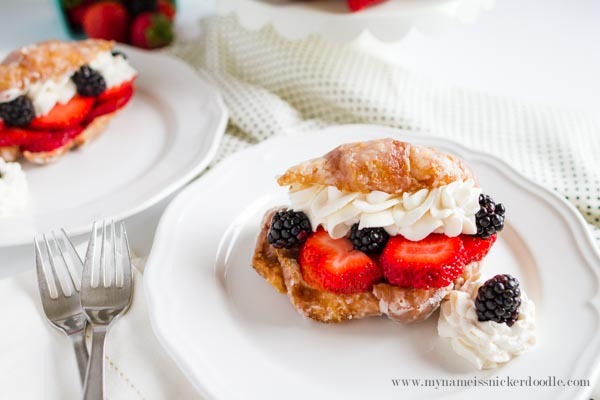 Strawberry Shortcake is one of my favorites, but instead of shortcake, pound cake or angel food cake, I wanted to use one of my favorite breakfast pastries…croissants! Our local grocery story has the most amazing glazed croissants in their bakery. Its the same method as glazed doughnut, but way better! I thought these would be perfect for this dessert, but not everyone has them available in their grocery store. I figured I could recreate them at home and they turned out really well! Along with the strawberries and homemade whipped cream I tossed in a few blackberries and loved the bit of tartness they brought. I’m excited to share this recipe with you and hope you love it as much as I do! In a medium bowl mix together powdered sugar with milk and 1/2 tsp vanilla until smooth. Dip each croissant into the glaze on both sides, covering it completely. Let the excess drip off and place on a parchment lined baking sheet or cooling rack with a cookie sheet underneath. You’ll need to let them set for 2 hours before cutting them for this dessert. In a medium bowl, whip together whipping cream, sugar and vanilla on high speed until firm peaks form. Don’t over beat because it will turn into butter! Slice croissants in half lengthwise almost in half. Place each onto a plate and open the croissants. 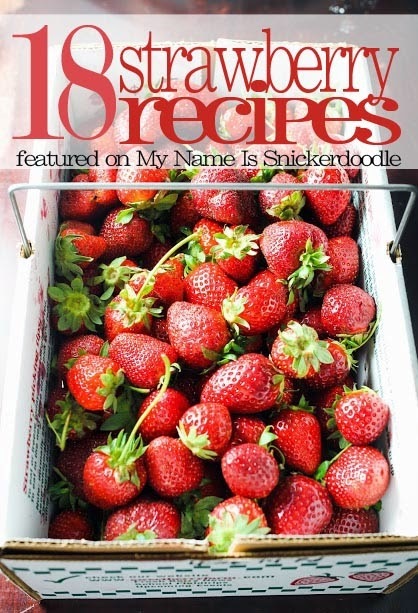 Layer with sliced strawberries and whipped cream and fold the top back over. Please pin so your friend’s can make this too! 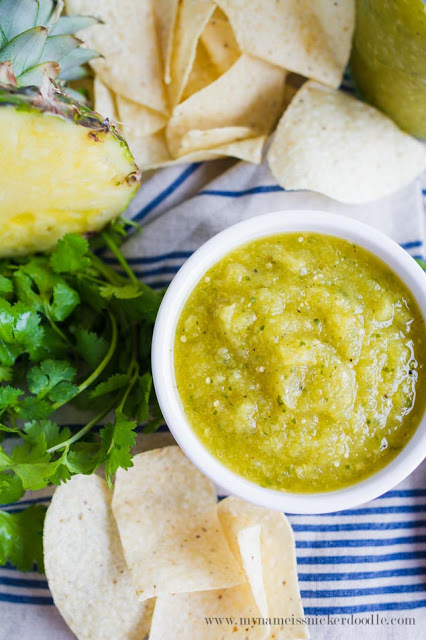 and her yumy Pineapple Tomatillo Salsa. Oh my goodness! These look divine! Could NOT agree more! Never heard of glazed croissants, have you?? MUST MAKE ASAP!! I would just serve plain old croissants, but you go and kick it up a notch by glazing them. Beautiful! These looks so easy and delicious. Perfect for a special breakfast, my family will love this idea. Yum!!! Just when you though croissants couldn’t get any better, along comes Amy’s glazed croissant recipe. So into this!! Thank you for sharing Amy’s recipe on Create, Bake, Grow & Gather this week. I’m delighted to be featuring it at tonight’s party and have pinned also! Your strawberry croissants look delicious! Thanks for having them shared at Snickerdoodle. Pinning. A glazed croissant? Shut the front door!!! This looks so good and I’m so happy that you updated the traditional strawberry shortcake with this. Thanks for sharing with us at Celebrate Your Story. Pinning! 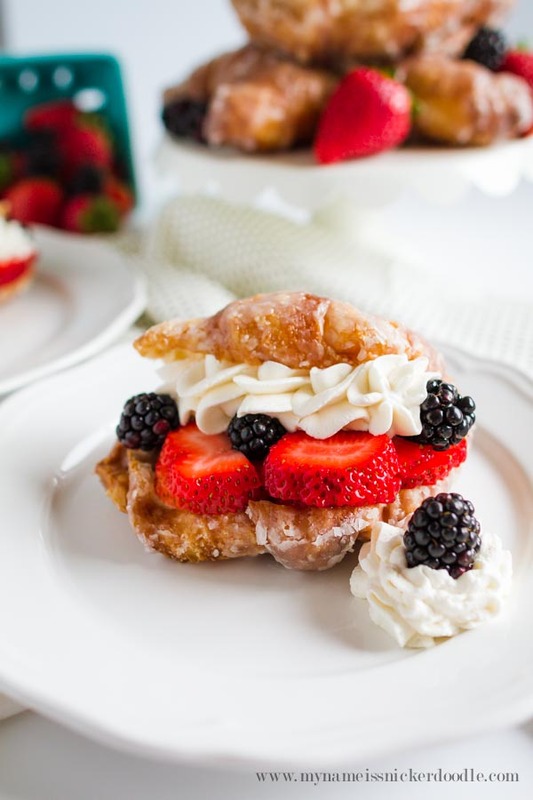 Your Sweet Berry Croissants will be a very special treat! Hope you are having a great day and thanks so much for sharing with us at Full Plate Thursday and come back to see us real soon! What a perfect match to those beautiful berries! Thanks for sharing at the What’s for Dinner party – Have a great weekend. 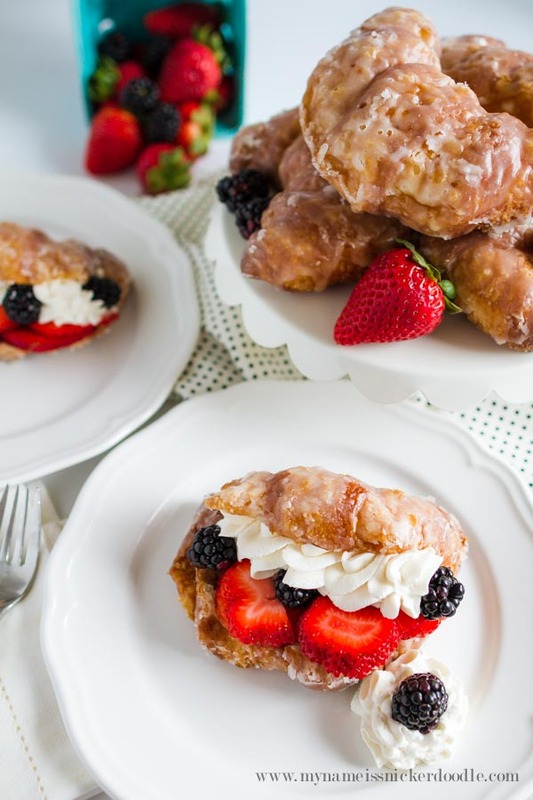 These sweet berry croissants look absolutely delectable! I definitely want to try making them 🙂 Thank you so much for sharing with us at Dishing It & Digging It & congratulations on being featured this week!